In this post, we are going to create first android app which will show result of multiplication of two user input numbers. We have already created Android hello world example before but it was too basic. We are not going to put much validations here. We will just create above screen which will show multiplication of two numbers in Result textview. 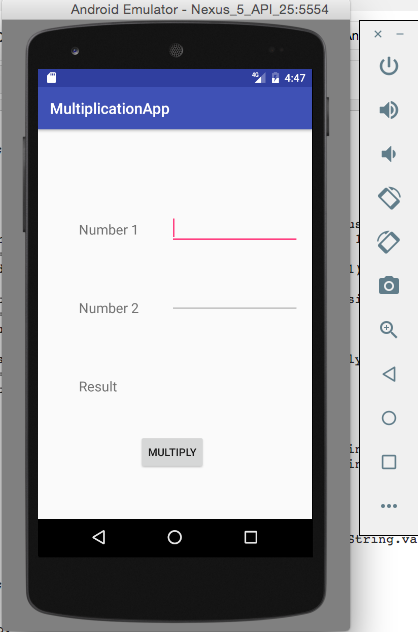 Create a new android project named “MultiplicationApp”. Provide Activity name as “MultiplicationActivity” instead of “HelloWorldActivity”. Go to res -> layout -> activity_multiplication.xml. Paste following code in xml file to create multiplication screen. Go to app -> java -> package -> MultiplicationActivity.java. We have also put click listener on button named “Multiply”. Provide user input numbers and click on multiply, you will get the result. We are done with first android app using android studio.